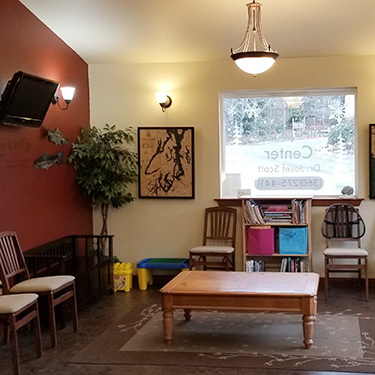 Belfair Chiropractic Center and Massage has been a Belfair staple for decades, serving the community for over 40 years. Though ownership has changed hands over the years, patients can always expect to be treated with the utmost respect while they receive custom, focused chiropractic care. When you choose us for your natural health needs, we can assure you that you’re a part of our family. Our mission is to educate patients that chiropractic care isn’t just about eliminating back or neck pain—it’s a lifestyle choice just like eating well and exercising. Your brain and nervous system need to be functioning at 100% if you want to live a happy and healthy life—and we can help make that happen! At our practice, we proudly welcome patients of all ages, from newborns to senior citizens and everyone in between. Your entire family is welcome with us—in fact, Belfair Chiropractic Center and Massage is a family affair—Dr. Scott’s wife, Rachel, also works in the practice. Each day, Dr. Scott is thankful to be able to do what he does. When he started chiropractic, his vision was to help people get out of pain by relieving their symptoms. Today, his goal is to help keep you well for a lifetime. We want you to be able to live the life you love. We’d love to invite you to schedule a consultation with our practice to learn more about how natural chiropractic care can benefit yourself or a family member. We proudly accept Medicare and most major insurance plans—simply bring your card with you and we’ll check for you.